Nordfab Quick-Fit Double Branch, sometimes known as Duck Foot, comes available in standard 30º and optional 45º. 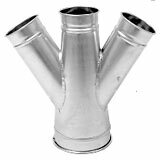 All Nordfab duct branches are priced by the large end. Now available in galvanized, aluminum, stainless and stainless+ with optional no. 4 finish. When ordering specify A, B, C, D.
*Note: Reducer at "B" or "D" may be required. Use formula above to determine. On sizes above 24", "A" is flanged. Add the cost of flange if "B", "C", "D" require flanges.